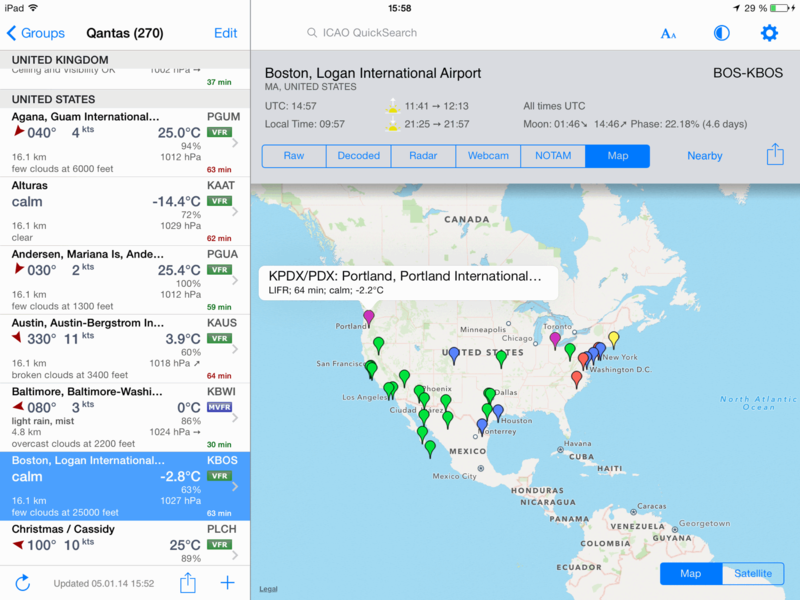 You can choose worldwide airport weather stations from the built-in database by either name or ICAO code. Data will be shown in its original format or fully decoded into easy understandable texts. 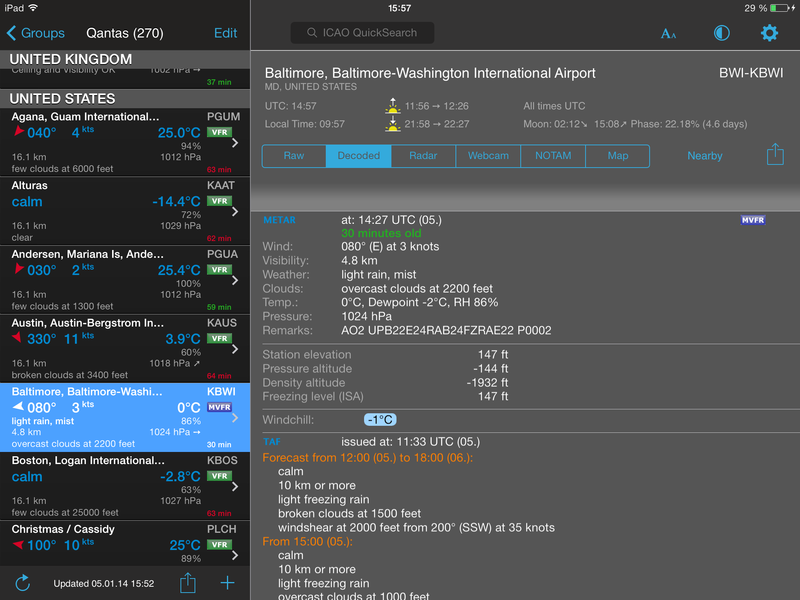 Try out AeroWeather Lite for free first. New to AeroWeather or unsure about what settings exactly do? >> Check the Quick Start/Help Page. Available in Chinese, Danish, Dutch, English, German, Finnish, French, Italian, Norwegian, Polish, Portuguese (Brazilian), Spanish, and Swedish. 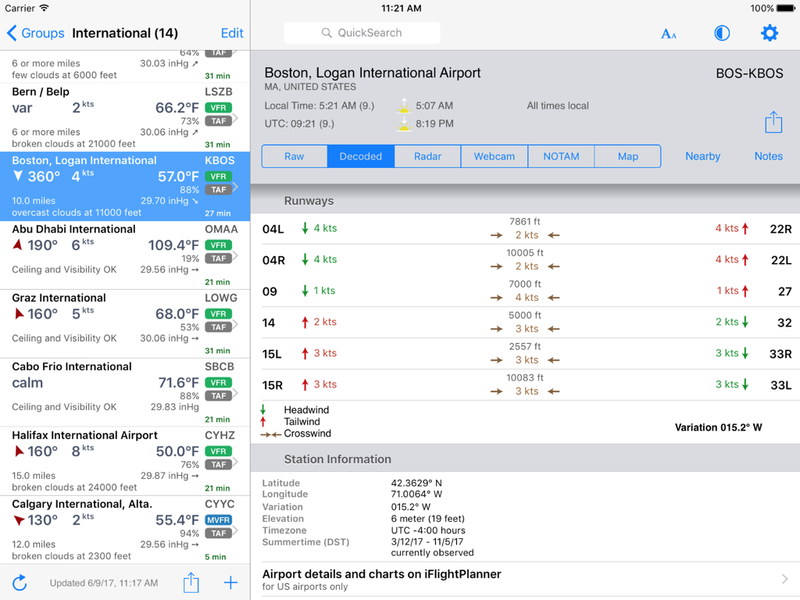 AeroWeather Pro uses weather data from freely available US NOAA and FAA services, which cannot be guaranteed. 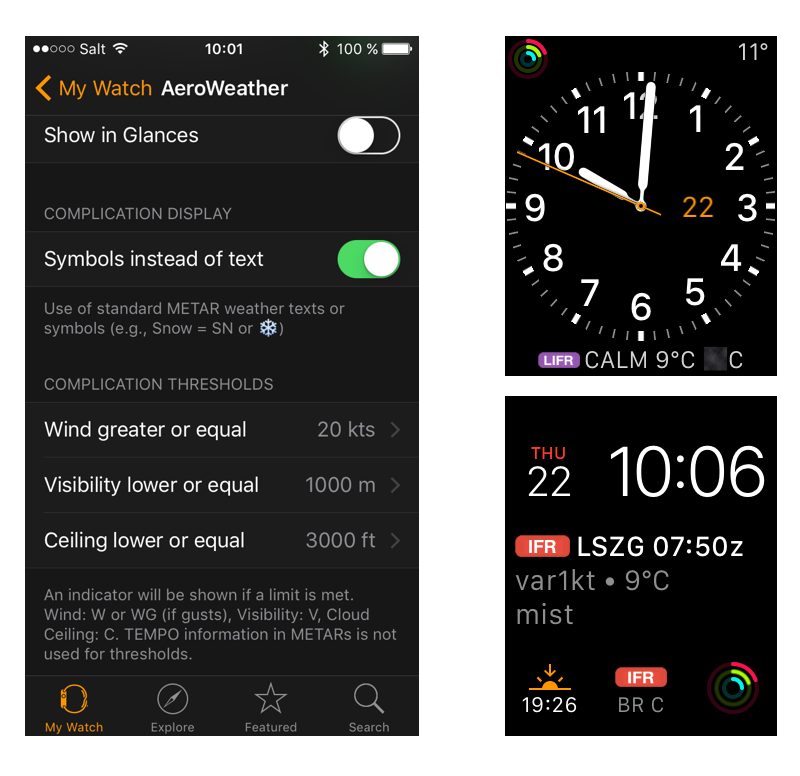 The cost for AeroWeather Pro is just for creation of the app and not to pay for any weather data. There are no additional charges for freely available weather data sources. There might be in-app purchases of additional data in future for data which I have to pay for as well. Data loading fails when using 3G/4G connection (WiFi ok). Usually mobile data setting for AeroWeather is not enabled. In the device’s settings go to “Mobile Data” and scroll down until you see AeroWeather. Data doesn’t show up on Apple Watch. 1) make sure that the widget group is created by the app (don’t create the group by yourself). 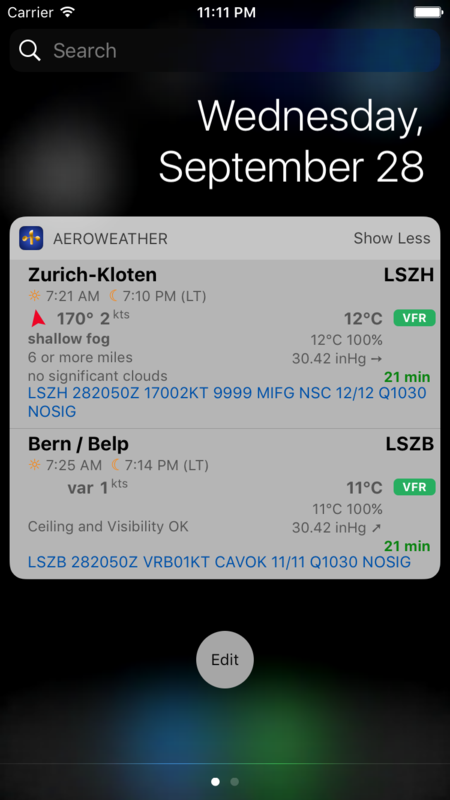 Go to “settings > today widget & apple watch” and enable it. Then go back and add stations to the widget group which was created automatically. 2) sometimes data doesn’t get transfer to the watch properly. Please go the widget group tap edit button and then just swap the first two stations and then press the done button. After that swap them back in the original order again. This will force an update to the watch. It only has to be done once and then it should run without problems. Can I transfer license/data to the Android version of AeroWeather. No. The Android version is developed by another company and has to be bought again. Also, data can’t be transfer at the moment (but might be available in future). Go to iPhone/iPad Settings and choose “AeroWeather”, and switch on “Recover App”. 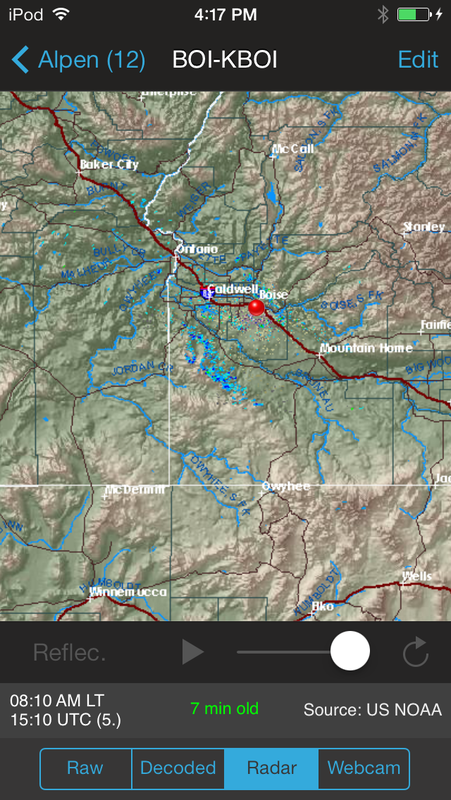 Next, kill the app thru task bar (double-click home button and swipe the AeroWeather view to the top) and start it again. How can I change group names or change sort order within a group? Simply tap on the blue circled ‘i’ button on the right side of any group name. How do I change temperature to Fahrenheit? Tap on the “i” icon to go to the format and unit settings. Switch off “Original station units” and set unit for temperature below accordingly. 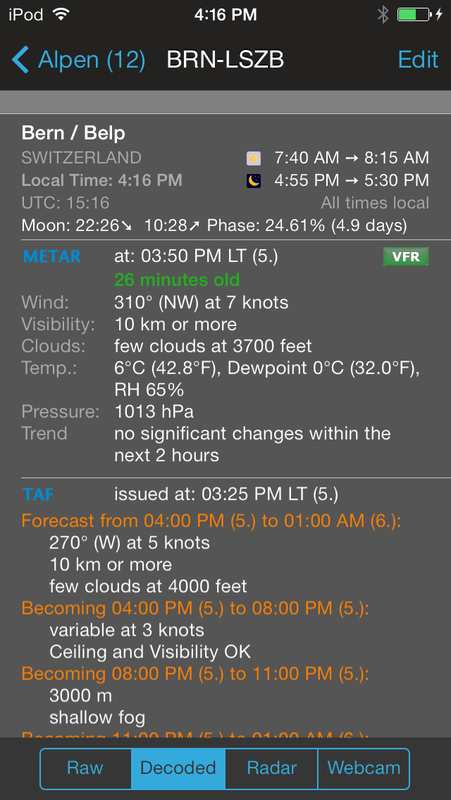 Temperatures in METAR/TAF are always in Celsius. So if “Original station units” is on, it’ll always display in Celsius. A station displays always just “data not available” only. Some stations do not (or just during daytime) report data or US NOAA does not provide them. Please find another airport station nearby. The airport/station is not shown when clicking on maps. Some coordinates may not be accurate anymore. Just mail me the ICAO codes and I’ll have them fixed. 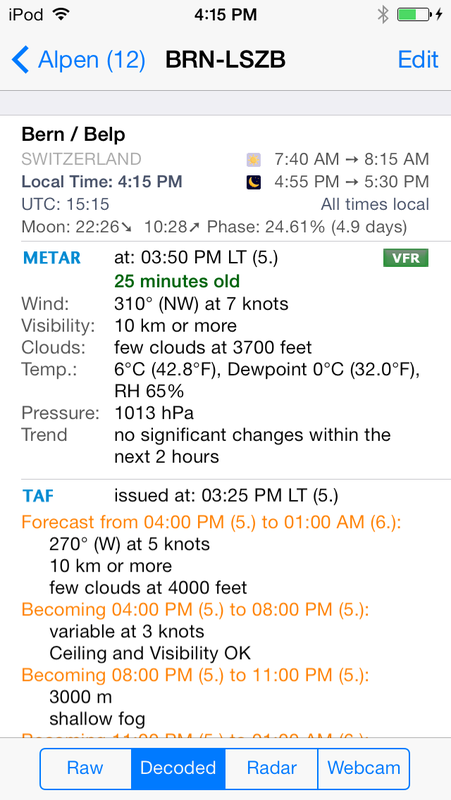 This can happen when the METAR/TAF of a station is really malformatted (which unfortunately does happen). If possible, mail me the METAR/TAF or at least the ICAO codes/stations names so I can enhance the parsing process (you may check the raw data directly from http://adds.aviationweather.noaa.gov/metars/). 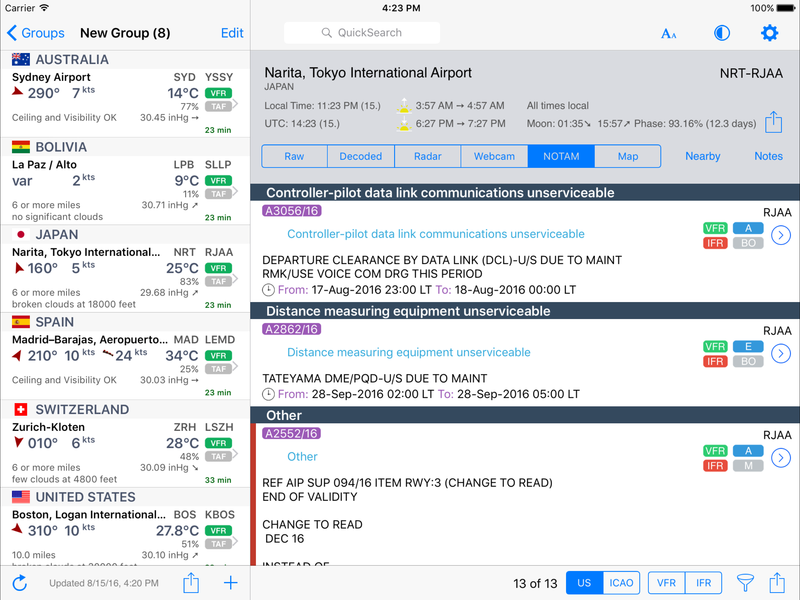 Contact us if you have a question, found a bug, have suggestions, or can offer translations for AeroWeather.